Kaolinite and halloysite are both dioctahedral 1:1 layer silicates and hydrated aluminum silicates. They are similar in genesis, structure and composition. Kaolinites and halloysites have the same chemical composition except that halloysite has a higher water content. Kaolinites have a platy sheet structure while halloysites can display tubular, spheroidal or platy morphologies. 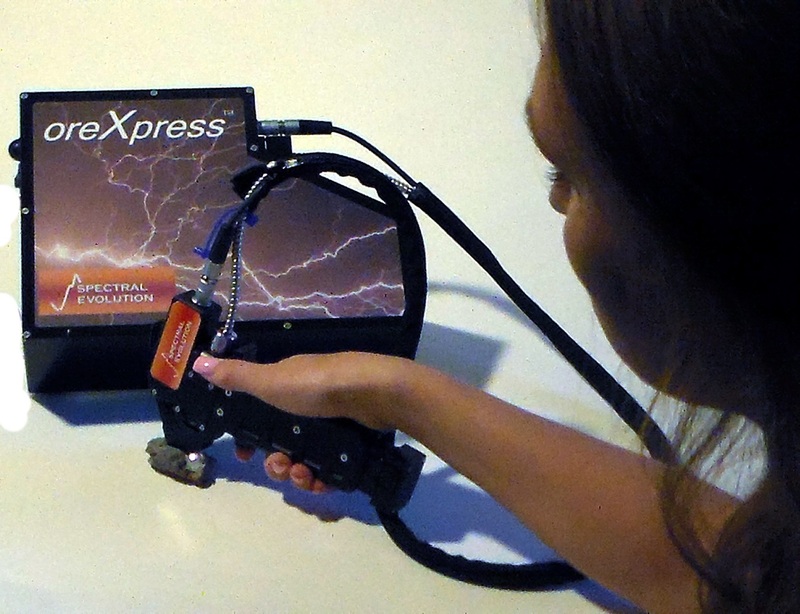 Distinguishing kaolinite from halloysite in the field can be performed with a field portable spectrometer such as the oreXpress or SR-6500 ultra-high resolution spectrometer. Kaolinite is identifiable by doublets at 1395 and 1412nm and 2160 and 2208nm. In well-ordered kaolinitie the doublets are seen as distinct absorption features. 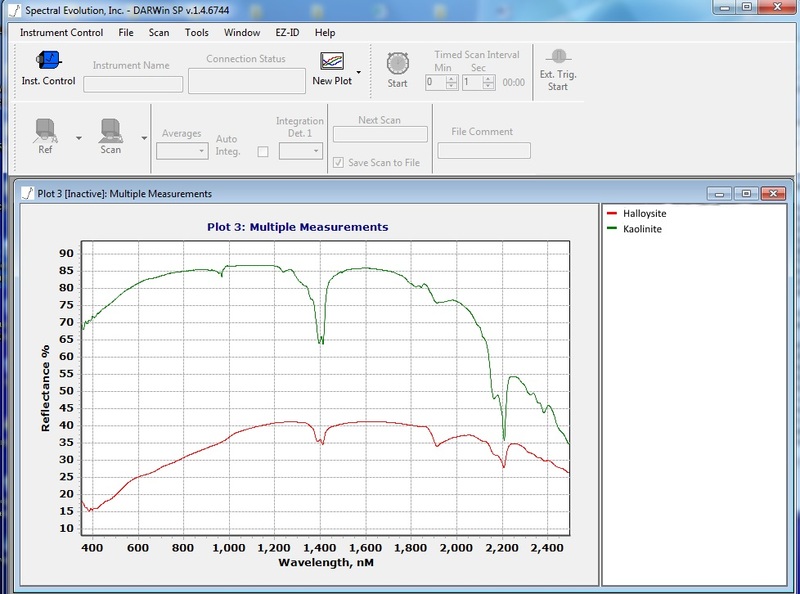 In less well-ordered kaolinite the shorter wavelength appears as a shoulder on the longer wavelength. Halloysite has similar absorption features to less well-ordered kaolinite with an additional broad water feature at 1912nm. Working with an oreXpress or SR-6500 field spectrometer from Spectral Evolution, a geologist can distinguish kaolinite from halloysite in the field by scanning at an outcrop, bench or pit. The spectrometers are also used to quickly scan core and save the data in a core shack. 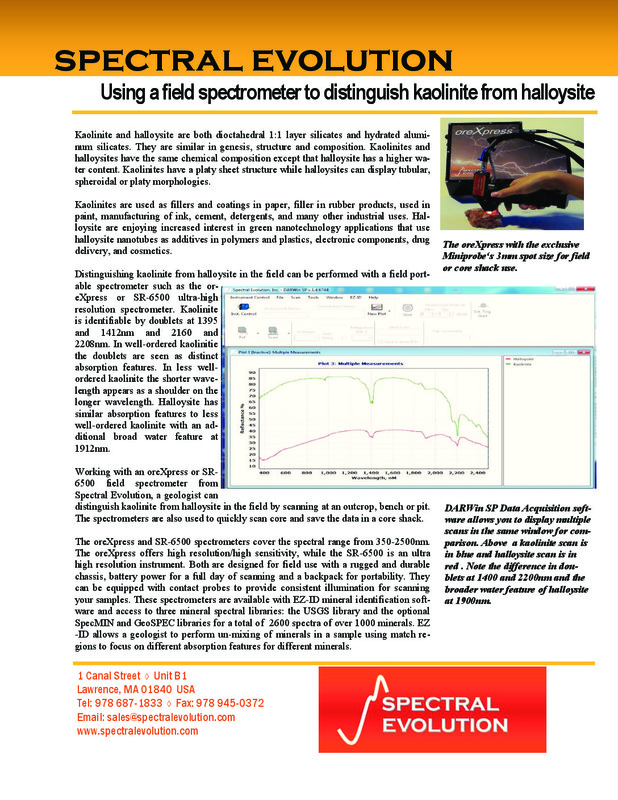 The oreXpress and SR-6500 spectrometers cover the spectral range from 350-2500nm. The oreXpress offers high resolution/high sensitivity, while the SR-6500 is an ultra high resolution instrument. Both are designed for field use with a rugged and durable chassis, battery power for a full day of scanning and a backpack for portability. They can be equipped with contact probes to provide consistent illumination for scanning your samples. These spectrometers are available with EZ-ID mineral identification software and access to three mineral spectral libraries: the USGS library and the optional SpecMIN and GeoSPEC libraries for a total of 2600 spectra of over 1000 minerals. EZ-ID allows a geologist to perform un-mixing of minerals in a sample using match regions to focus on different absorption features for different minerals. The oreXpress with the exclusive Miniprobe‘s 3mm spot size for field or core shack use.